Finally, it’s here! Coaching the 4-2-3-1 Advanced Tactics provides you with an in-depth look at the formation that is dominating European soccer. Packed with tactical insights on the specific patterns of play of Manchester United and Real Madrid, Coaching the 4-2-3-1 Advanced Tactics shows you how you can utilize this highly flexible formation to outwit teams playing a traditional 4-4-2 or 4-3-3 and to create more scoring opportunities. The 4-2-3-1 formation is much more than just an attractive playing style. This formation is fast consigning the 4-4-2 and 4-3-3 to the history books after it was used by three of the semifinalists in the Euro 2012 tournament. The 4-2-3-1 is now used by many of Europe’s elite club sides, includingChelsea, Manchester United and Real Madrid, because it enables them to break through teams rooted to the spot playing more dated, rigid formations. Coaching the 4-2-3-1 Advanced Tactics is packed with tactical insights and an analysis of the patterns of play of Manchester United and Real Madrid, both in defense and in attack. Utilizing in-depth analysis, real screenshots from actual games and detailed diagrams, this book shows you exactly how elite players, such as Cristiano Ronaldo, Wayne Rooney and Xavi Alonso, play in this formation and how it enables them to play in a more flexible, attacking style that can rip opposition teams apart. In addition, Coaching the 4-2-3-1 Advanced Tactics provides fifteen complete training sessions for drilling your teams in how to play this devastating formation. This includes defensive training sessions on pressing triggers, mid defending shapes and controlling line depth along with attacking drills on triangulation, third man runs and attacking fullbacks. This book is entitled Advanced Tactics for a reason: It shows you everything you need to know about how to fully utilize the 4-2-3-1 to take your team’s performance to the next level. “The modern game is ever evolving tactically. Coaching the 4-2-3-1 Advanced Tactics book takes you on a tactical journey in both attack and defensive situations. Stevie has done a great job in building upon the 1st book and shown the importance of pattern play within the system. This book will help my club coaches understand and implement the 4-2-3-1 system, players roles and responsibilities, assess oppositions weaknesses in their system and how to exploit it and how to transition from other systems such as 4-4-2 or the 4-3-3 as well as others by players moving in short distances. I will be using this book as a tool for my coaches to better understand how the 4-2-3-1 can improve team possession and improve teams attacking soccer. The game of soccer never stands still. New formations are evolving all the time that can give teams an edge over opponents stuck with more rigid styles of play. The 4-2-3-1 is one such formation that has risen to prominence over the last decade and is now utilized by many of Europe’s elite sides. Its popularity comes from its ability to rapidly shift to a 4-3-3, 4-4-1-1 and other formations in response to how the opposition is playing or to suit the stage of the game. What’s more, the additional line of players provided by the 4-2-3-1 enables teams to swamp the midfield as well as gain more players in the attack, making it a highly aggressive and entertaining formation to watch. It’s no wonder that teams with some of the most gifted attacking players in the modern game choose to play the 4-2-3-1. Coaching the 4-2-3-1 Advanced Tactics takes the author’s first book, Coaching the 4-2-3-1book to the next level. It expands on the insights in the previous book while also providing a complete coaching guide in its own right. It shows you in –depth how the 4-2-3-1 is played by Manchester United and Real Madrid, with step by step examples from real life games along with practical advice and analysis on how any team can use this formation to outwit and dominate the opposition, both in defense and attack. Coaching the 4-2-3-1 Advanced Tactics provides an expert analysis of the playing style and tendencies of Manchester United and Real Madrid as well as complete training sessions for drilling your players in how to utilize the formation effectively. The first chapter looks at the tactical advantages that can be gained from the formation. This includes the flexibility and options gained from being able to make short passes between four lines instead of three and positional rotation in the center. This chapter also looks at the differences with the 4-4-1-1, the 4-5-1, 4-4-2 and 4-3-3, and the roles and responsibilities of every player. Grieve now looks at how to transition the team from a 4-3-3 to a 4-2-3-1 during the attacking phase and where players need to be to gain the maximum advantage. Using detailed diagrams, this chapter shows you exactly where players need to be in order to transition back to a 4-3-3 smoothly. Grieve also analyses which formations struggle against a team playing the 4-2-3-1, with example scenarios of the ball in different areas of the pitch, such as how you can get the ball to the striker from the wings and to switch the ball to an attacker on the far side of the pitch. Spain is renowned for playing some of the most attractive and attacking soccer in the world. A core reason for this is the flexibility of the 4-2-3-1 formation. Grieve looks at how Spain uses the flexibility in midfield to retain possession and to push fullbacks into more advanced positions. Utilizing real screenshots of games, Grieve explains how Alba and Villa are able to exploit the space between the fullback and center back and how Alba is able to create overlaps with Villa. Grieve now analyses how Real Madrid and Manchester United use the 4-2-3-1. This includes an indepth look at how Manchester United defeated Arsenal’s 4-3-3, where ex-Gunners player Van Persie was able to score freely thanks to the extra numbers on the wing. Grieve also analyses the freedom the formation gives to Wayne Rooney, enabling him to bring opposition players out of position and to switch passes to create 1v1 situations on the far side of the pitch. Real Madrid has grown to dominate Spanish and European soccer, thanks to Jose Mourinho’s management and the 4-2-3-1 formation. In this chapter Grieve looks at how Mourinho utilizes the special abilities of his players. This includes the fluidity with which Alonso, Khedira and Ozil play the triangular midfield and how Ronaldo makes his runs inside from the left side of the pitch, with Di Maria able to cut inside at will. The 4-2-3-1 provides amazing defensive flexibility, with all players able to provide cover spread over four lines. In this chapter, Grieve looks at how Arrigo Sacchi’s AC Milan and Antonio Conte’s Juventus teams used variations of the 4-2-3-1 to lockdown their goal from attacks. Grieve analyses how your team can move from a 4-3-3 to a 4-2-3-1 to counter an attacking 4-4-2 side. This includes when the ball is at different defensive phases, such as with the ball at center back or fullback. Grieve then looks at how to reshape the defense if the opposing attacker gets into an advanced position, such as in the corner to make a cross. This chapter looks at how the 4-2-3-1 enables the fullback to work with a wide midfielder to defend on the sides of the pitch with a third midfielder able to shift over to close opposition attacks down. This chapter then looks at how to switch the pass to the opponents weak defensive side and how to track midfield runners once you’ve stopped the immediate attack. Grieve provides five complete sessions comprising of multiple exercises. This includes drills for controlling line depth and covering key zones, defending on the sides, pressing triggers and midfield defensive shapes. All the sessions can be combined with transition play and counter attacking sessions, and every drill is provided with coaching points, diagrams and progressions. This book also provides ten complete attacking sessions, which include drills for small group play, triangulation, overlaps, third man runs and finishing. Grieve recommends finishing every session with a small sided game that encourages your players to practice the skills from the drills and to ask questions as to where they should move to and why. If you’ve ever wanted to imitate the exciting and attacking playing style of Manchester United or Real Madrid, this book shows you how. Coaching the 4-2-3-1 Advanced Tactics is packed with in-depth analysis of how these teams get their players into the right positions to exploit static opposition and to get the ball into attacking positions. Along with the theory, you get 15 complete training sessions comprising of multiple drills you can use to train your players on positioning and how to play the 4-2-3-1 effectively. If you’ve already bought Stevie Grieve’s previous book, Coaching the 4-2-3-1, you will find there’s still lots to learn in this follow up book. 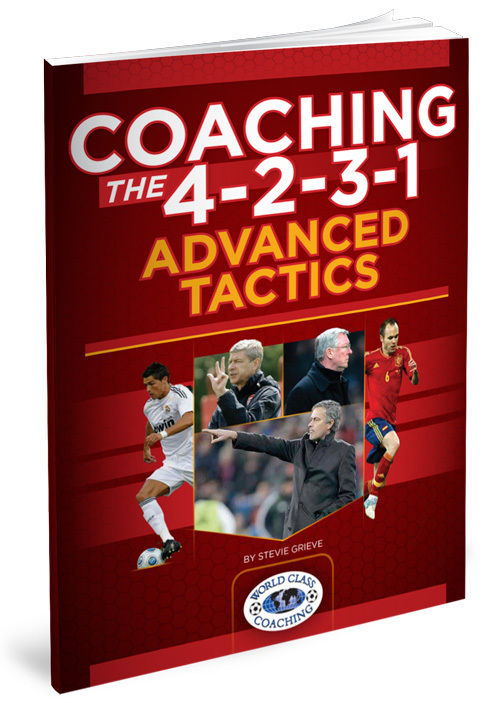 If you haven’t bought the previous book, you will discover thatCoaching the 4-2-3-1 Advanced Tactics is a complete coaching guide in its own right. It provides everything, from the theory on roles and responsibilities through to real life practical examples up to training exercises to get your players playing it effectively. So whether you already play the 4-2-3-1 or would like to start, this book tells you everything you need to know in Grieve’s straightforward coaching style. “Coaching the 4-2-3-1 Advanced Tactics is a great addition to the Coaching the 4-2-3-1 book. 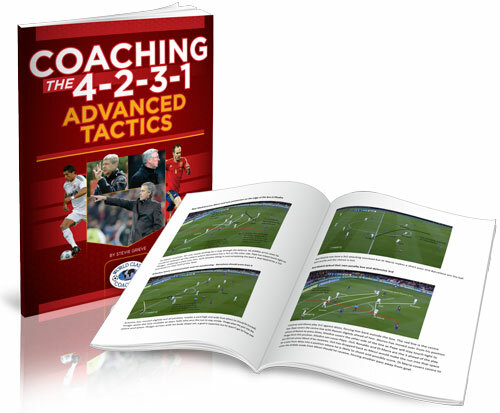 The Advanced Tactics book allows me to understand the 4-2-3-1 system in more depth. The book uses specific patterns of play and shows pictures of these patterns being used in actual matches. “This book breaks down the 4-2-3-1 formation very well, highlighting the responsibilities of the players in both attack and defense and the transition between the 4-3-3 and 4-2-3-1. The use of real life examples with teams such as Real Madrid and Manchester United and breaking down their styles of play helps me to understand the different ways of playing the same formation. The coaching sessions are clear and concise, covering all aspects of coaching defending and attacking in the 4-2-3-1 which I will certainly be using with my team.” – Jebreel Bubtana – Director of Marketing at BRASA – Brazilian Soccer Academy, NSCAA Advanced National Diploma, coach at Westfield Soccer Association, NJ. Coaching the 4-2-3-1 is not just a formation or system of play. It can also be described as a sort of philosophy on how the game is played. This philosophy is based around flexibility. One of the strengths of the 4-2-3-1 is the flexibility it provides with the interchanging of positions of the midfielders and forwards. This is one of the reasons opponents find it really hard to play against. This philosophy can AND should be adapted at a younger age too. So for those age groups that don’t play 11v11, this free eBook shows you how to adapt the 4-2-3-1 to the small-sided soccer that younger teams play. Not only that, if you have a team that is just a year or two away from moving to 11v11, this eBook is perfect for helping them make the transition from the smaller numbers they are playing to the full blown version of the 11v11 4-2-3-1. 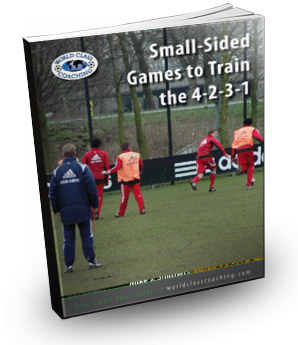 GREAT FOR TRAINING SESSIONS – The material in this eBook is also perfect for using the smaller numbers to create your 4-2-3-1 training sessions. If you have 18 players or less on your team, you can use the formations in this eBook to set up small-sided games specifically designed to teach the 4-2-3-1. And it’s free with your order of Coaching the 4-2-3-1 Advanced Tactics. Euro 2012 marked the arrival of the 4-2-3-1 as a dominant formation on the international scene. But coaches like Jose Mourinho and Alex Ferguson have been playing it for years because they know it has the flexibility and attacking fluidity that can overpower teams playing older, more rigid formations. It’s no secret that the 4-2-3-1 is a key reason for their success at the top of their respective leagues. Now you can discover how to imitate their success in Coaching the 4-2-3-1 Advanced Tactics. It explains everything you need to know about playing and coaching the formation. Step by step screenshots and clear explanations enable you to see exactly how elite players, like Cristiano Ronaldo, Wayne Rooney and Xavi Alonso, play in the formation and how they take advantage of its flexibility to create the abundance of goal scoring opportunities that bring them success. To replicate their success playing the formation, you get fifteen complete training sessions for developing your team’s ability to play the 4-2-3-1 effectively. So everything is covered. If you want to step up and harness the most innovative and flexible formation in modern soccer, Coaching the 4-2-3-1 Advanced Tactics is an in-depth tactical and practical guide that shows you how.